Marking fringe Placing pattern piece on the fabric, draw around the pattern to make fringe. To mark easy, fix the pattern with paper weights etc. I used small magnets in picture above. Place a corrugated paper sheet (used for carton box) on your working table. And check that the needle of your drawing pin is shorter than the thickness of the sheet. If long, Place more sheet so that your table may not be damaged. 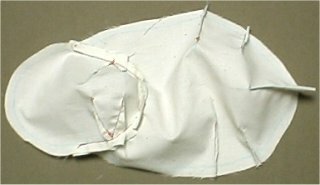 Place the fabric back body piece on the pattern matching the edges of the pattern to the edges of the fabric. 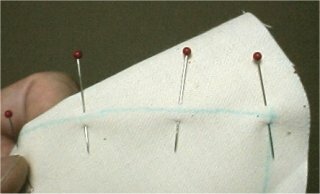 And stab the drawing-pins aslant and half of needle. You can see the lines drawn on the pattern through the fabric. Trace all the lines on the fabric. But dart lines are not need to do for the right side. 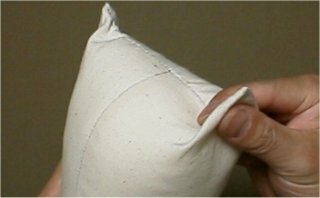 In the picture above, magnets are used to hold fabric. 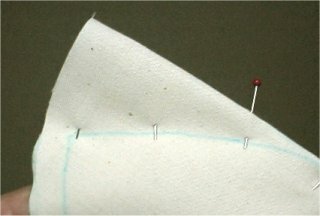 Remove drawing pin and turn the fabric over on the pattern, matching the edges and pin again. This Is the wrong side of fabric. 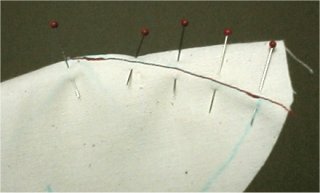 Trace the sewing line around and 7 dart lines (and center lines of darts). In the picture above, magnets are used to fix fabric. Pin along the dart line Confirm pins are on the dart line on the rear face Sewing darts with accuracy, we can get smooth body. 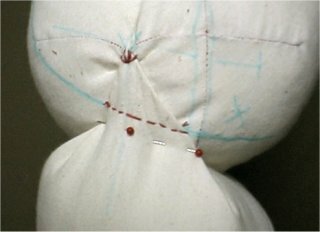 To sew darts with accuracy, Pin along the dart line, and looking them from backside, confirm the dart lines of both faces are matched correctly. 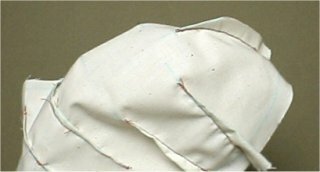 Trim excess fabric of the largest dart at the bottom. Sewn dart Folding the center line of each dart, pin and sew the dart. Completed front body piece Sew all nine darts to complete front body piece. Why such a lot of darts? 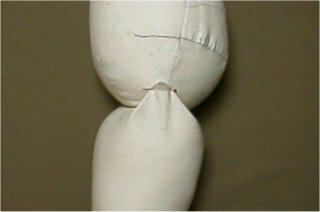 She keeps her form not by the shape of filled fiber but to balance the tension of fabric and pressure of filled fiber. So fabric tension needed to keep evenly by the darts. Since she have to keep her body soft and have to keep her form for long periods. 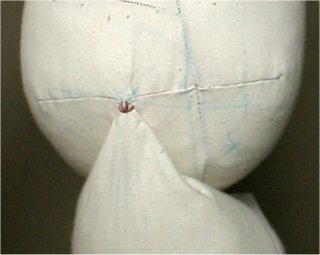 The same way, sew another front body piece. Sew together front and back body pieces and stuff. 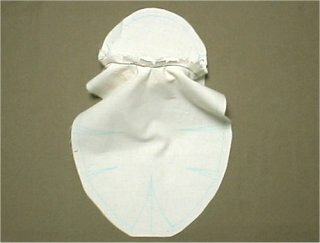 Two body pieces (right and left) have the same form. but the openings (to stuff) are located to different side. Stuffed body There are two tips on the top end of the upper leg (labeled "K" on the pattern). 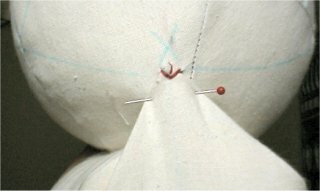 We sew this tips on two "X" marks on the body. But there are four "X" marks (labeled S on the pattern) on the bottom portion of the body. So there are four "X" marks but we apply only two "X" marks. 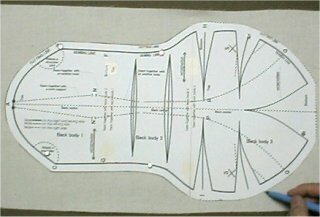 So, reading instructions below, carefully pick out two correct "X" marks from four "X" marks to sew a leg on. 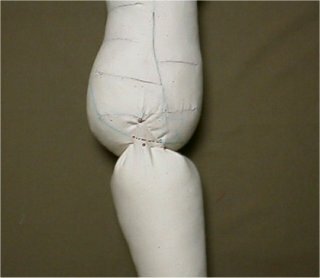 At first we attach left legs under the left body. (In this instruction left DON'T means left side for you, left means left side for Cindy.) Left body has opening (to staff) in it's left side. 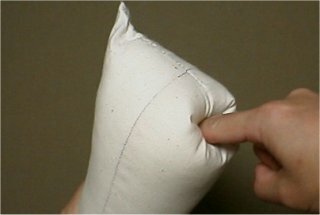 Pull it and form a tip. 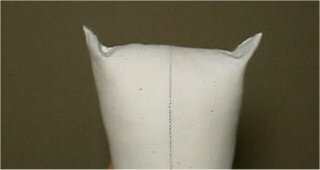 To carry away filling in the tip, at first push the tip (on the top of the upper leg) in to the upper leg. then pull it out agein. The right leg is sewn. 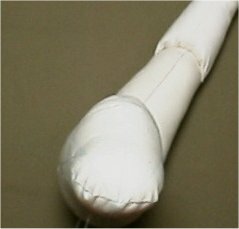 In the same way (right and left are reversed in instructions), sew right leg on the right body.